Gwinnett County’s largest selection of beer, wine and liquor offers mega deals and mega service in Suwanee. With the holiday season upon us, many of us will be hosting family get-togethers, parties and extravagant dinners. Whether you are looking for the perfect wine to pair with your Thanksgiving feast, the best eggnog to spike at your company party or a local craft beer to share with your visiting relatives, Mega Package Store in Suwanee has you covered. Their beer, wine and liquor experts can offer helpful suggestions to guide your beverage menu for any occasion. Owners, Oknam Kim and Sang Joon Kim, have been proud residents and business owners in Gwinnett for over 25 years. When they purchased Mega Package Store in 2014, they had never worked in the beverage industry before. “Actually, I do not even drink alcohol, but I know how to run a business and it is about the team you have. I have such great employees… my staff are the experts,” said Oknam. And, the feeling is mutual between the staff and owners. “Employees are incentivized because the owners also work so hard – they are here seven days a week working side by side with us,” said Jerry Giacobe, the Floor Manager. And while the (truly mega) Mega Package Store has the largest selection of beer, wine and liquor in Gwinnett, they pride themselves on being a “neighborhood store,” said Oknam. “We have so many regular customers that we know really well now,” explained Lindsay Dockery, Assistant Wine Manager. Other package stores in the area only further motivate the Kims to make the store even better. “I always like competition,” said Oknam. “It really makes you grow and challenges you,” she continued. One way they have differentiated themselves is by offering monthly “Mega Deals” – a customer bonus program with a list of 20 or so items on special each month that are greatly discounted. “Also, because of the large size of the store and the amount of inventory we buy, we already can offer our products at a lower price point,” said Giacobe. 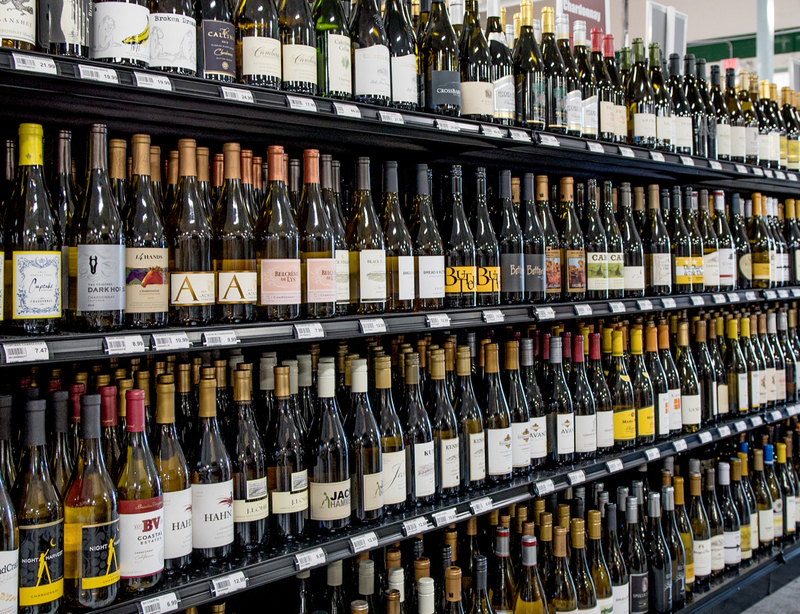 Mega Package Store boasts thousands of bottles of wine, every type of liquor imaginable and a craft beer selection to satisfy even the most diehard beer lover. But, if for some reason, you cannot find what you’re looking for, then special order forms are available. “Some people might feel uncomfortable putting in a special request, especially if they only need one item, but it’s okay – we want you to be able to do that. If we can get it for you, then we definitely will,” explained Giacobe. “Everyone’s taste is different and I want to make sure we have what you are looking for at a good price and with excellent service,” Oknam added. For those wanting to try something new, they are encouraged to attend Mega Package Store’s weekly beer and wine tastings in the Tasting Room directly next to the store. Every Saturday from 1-3pm they feature 4-8 different wines to try. And at only $5/person with small snacks that pair with the wine, it is a great way to expand your wine palate at a great price. Immediately following the wine tasting, beer lovers are invited to try complimentary beer tastings from 4-6pm on Saturday where Shawn Crews, Beer Manager, will feature about 5 new beers for customers to try. Crews makes sure that there is always a great variety of beer offerings and with the recently expanded refrigerated section in-store, customers can take home individually-sold, cold bombers – which is also a great way to try something new. The vast selection of product is enough to inspire any libation lover in the area, but it is the customer experience, great prices and quality of service that keep Mega Package Store regulars coming back for more. Mega Package Store boasts thousands of bottles of wine, every type of liquor imaginable and a craft beer selection to satisfy even the most particular beer lover. But, if for some reason you cannot find what you’re looking for, then special order forms are available. “Some people might feel uncomfortable putting in a special request, especially if they only need one item, but it’s okay – we want you to be able to do that. If we can get it for you, then we definitely will,” explained Giacobe. “Everyone’s taste is different – I want to make sure we have what you are looking for at a good price and with excellent service,” Oknam added. For those wanting to try something new, they are encouraged to attend Mega Package Store’s weekly beer and wine tastings in the Tasting Room directly next to the store. Every Saturday from 1-3pm they feature 4-8 different wines to try. And at only $5/person with small snacks that pair with the wine, it is a great way to expand your wine palate at a great price. Immediately following the wine tasting, beer lovers are invited to try complimentary beer tastings from 4-6pm on Saturday where Shawn Crews, Beer Manager, will feature about five new beers for customers to try. Crews makes sure that there is always a great variety of beer offerings and with the recently expanded refrigerated section in-store, customers can take home individually-sold, cold bombers – which is also a great way to try something new. with the recently expanded refrigerated section in-store, customers can take home individually-sold, cold bombers – which is also a great way to try something new.